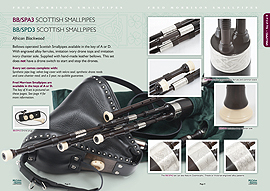 Using embedded page turning technology, we are able to present the stunning detail of our bagpipes, chanters, reeds and accessories in an easy to use magazine format, which you can move around the screen and zoom right in on the details you want to see. You need Adobe Flash Player to view our digital brochure. Click on the brochure to view in fullscreen. You can also download the brochure as a PDF file to keep and view offline.